What is BizAutomation Cloud ERP? BizAutomation Cloud ERP is a complete and robust ERP platform created to accelerate and smoothen all your back-office operations and processes. It is a part of the BizAutomation business suite and works well its sister platforms BizAutomation CRM, BizAutomation Accounting, BizAutomation eCommerce, and BizAutomation PSA. Because it communicates and functions seamlessly with the entire BizAutomation platform on a single database, users are able to enjoy a fully integrated enterprise. BizAutomation Cloud ERP offers users with a vast set of powerful features that simplify and speed up processes, manage and fulfill orders, ship and deliver on time, and much more. The software grants users total control over their warehouse and inventory, automate their workflows, manage prices and promotions with ease, and simplify work orders among others. 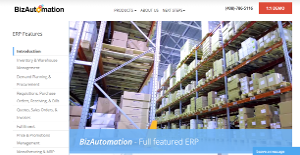 BizAutomation Cloud ERP provides small and medium B2B and B2C with a unified ERP solution that is built to address all aspects of their operations, such as managing their warehouses and staying on top of their inventory, facilitating orders, and shipping to clients among others. With BizAutomation Cloud ERP, you have a software that easily replaces traditional systems many smaller B2B and B2C companies in the U.S. use to run their businesses such as QuickBooks, Xero, Zoho, inventory management systems such as FishBowl, and e-commerce platforms like BigCommerce. You also get an affordable ERP solution that is ideal for your small to mid-size operations. For small and medium businesses that can’t afford an expensive ERP platform, BizAutomation ERP delivers a strong, powerful, and true cloud-hosted ERP solution for a fraction of the cost of NetSuite, Acumatica, SAP Business One or Sage. It is a perfect medium for businesses that have outgrown their integrated CRM and accounting platforms but can’t invest in a true ERP solution because of financial constraints. BizAutomation Cloud ERP offers strong accounting capabilities, decent CRM, and awesome e-commerce features and more. The best part is that BizAutomation Cloud ERP continues to improve to meet the needs and demands of its users. Give them a suggestion and they will see what they can do to further improve their platform and keep you satisfied. What Problems Will BizAutomation Cloud ERP Solve? When a company uses multiple systems for accounting, CRM, and other aspects of their operations, there is data duplication. It happens EVEN when the systems they run on use connectors between each other. For instance, it is very typical for CRM systems such as Sugar, Zoho or SalesForce.com to connect to QuickBooks, and for QuickBooks to connect to inventory system such as FishBowl. Shipping and E-Commerce can also be used, but the underlying theme is that ALL these systems have duplicate databases for many of the same tables such as customers, inventory, pricing, orders, and so forth. Reconciling all this duplicated data is impossible as there’s no single version of the truth. Reporting and workflow become impossible across all systems, not to mention the multiple logins, and billing required. BizAutomation encompasses all these systems on a single platform based on a single database that enables true integration, reporting, and workflow. Companies have different wants and requirements and no software platform can be perfect in such a condition. It is useless to try to find an ideal off-the-shelf software app that meets all your business wants. The intelligent thing to do would be to adapt the application for your unique wants, staff member skill levels, finances, and other factors. For these reasons, do not hurry and subscribe to well-publicized trendy systems. Though these may be widely used, they may not be the ideal fit for your specific needs. Do your groundwork, investigate each short-listed application in detail, read a few BizAutomation Cloud ERP reviews, speak to the vendor for clarifications, and finally settle for the product that offers what you need. How Much Does BizAutomation Cloud ERP Cost? We realize that when you make a decision to buy ERP Software it’s important not only to see how experts evaluate it in their reviews, but also to find out if the real people and companies that buy it are actually satisfied with the product. That’s why we’ve created our behavior-based Customer Satisfaction Algorithm™ that gathers customer reviews, comments and BizAutomation Cloud ERP reviews across a wide range of social media sites. The data is then presented in an easy to digest form showing how many people had positive and negative experience with BizAutomation Cloud ERP. With that information at hand you should be equipped to make an informed buying decision that you won’t regret. What are BizAutomation Cloud ERP pricing details? What integrations are available for BizAutomation Cloud ERP? If you need more information about BizAutomation Cloud ERP or you simply have a question let us know what you need and we’ll forward your request directly to the vendor.